To start I would like to thank Prisoners Action Committee for creating the only space for show casing the art aspect of my project called, “Women Political Prisoners of Iran: Memories, Memoirs, and the Arts.” I also would like to thank the sponsors and those who made the presence of our speakers possible: the Women and Gender Studies Institute of the University of Toronto; Luci Mok whose organizational talent is always much appreciated; several of my graduate students at OISE: Brook Thorndycraft, Bethany Osborne, Soheila Pashang, and Tammy Mahmod. Shahrvand, the weekly Iranian paper who is also sponsoring the presentation for the Iranian community. Finally, many thanks to those women who experienced prison themselves and now are involved with my project: Anahita Rahmani and Marina Nemat. It is an honour to introduce to you two women who were political prisoners in Iran, Soudabeh for eight years and PanteA for four years in the 1980s. You will learn about the experience of Soudabeh and PanteA while Iran continues to occupy a prominent place in media reports throughout the world. Everything indicates that the United States is targeting Iran in its third major military adventure of this decade. It is a precarious situation. The US may launch a war, even though a more restrained one comparing to full occupation of Iraq, or it may try new forms of warfare, a dirty war of attrition, destruction, and sabotage. While many of us oppose this war strongly, it is important to realize that Iranians themselves are opposed to the theocratic state. Since this theocracy was set up 28 years ago, Iranians, especially women have struggled against it. They want to change this regime, and replace it with a democratic state. This is very different from the US project of regime change. The peoples of Iran are fully capable of deciding their own destinies. No evidence can be more powerful than the experience of Iran’s political prisoners. We can be both against the US imperialist war and the Islamic fundamentalist regime of Iran. There is no contradiction in such a position. We can be against the war and in support of the struggle of Iranian women against this theocratic regime. Let’s learn from our guests. I welcome both guests. 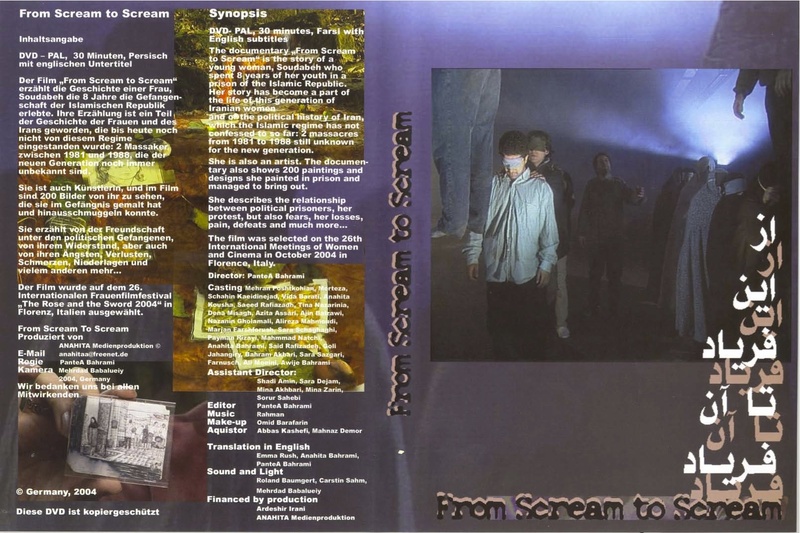 The film is called From Scream to Scream, by PanteA Bahrami. This documentary is the story of a young woman, Soudabeh Ardavan, who spent 8 years of her youth in a prison of the Islamic Republic. Her story is a part of the story of this generation of Iranian women and a part of the political history of Iran, which the Islamic Regime did not speak about and hid until now. Massacres from 1981 till 1988 are still unknown for the new generation. Soudabeh is also an artist. There are 200 paintings and designs in this documentary that she painted in prison and sent out of jail illegally. She describes the relationship between political prisoners, her protest, but also their sadness, pain, fear, horror, loss and much more… This documentary was selected in 26 Edition of the International Meetings of Women and Cinema in October 2004 in Florence, Italy and in the International Women Film festival in Cologne in October 2006. PanteA Bahrami has earned her PhD in journalism and media from the University of Dortmund, Germany. Her films, “Islam: My Identity or the Reason of My Escape” and “FromScream to Scream” have been selected for international film festivals. Dr. Bahrami has published articles on the theme of her films and has taught video editing and other courses in several German institutions of higher education. She also conducts documentary film workshops for students and other young people. Soudabeh Ardavan is an Iranian woman, a former political prisoners now living in Sweden. She spent eight years of her precious life in the prison of the Islamic regime of Iran. She is an artist who drew prison life while she was in jail. Through these images, Soudabeh tells her story of hundreds of other women with whom she shared days of pain, sorrow, love and care. Soudabeh Ardavan’s powerful book of Prison Drawings is the first visual depiction of atrocities committed against thousands of women in prisons of Iran.